In order to calculate the value for the component term ( i.e. middle term) do you treat positive aspects differently from negative. For eg for simplicity if the were only 2 aspects, a square and a trine to consider and the were in full aspect on a certain date and the weight given was 1 , would the middle term be the sum of +1 and -1 =0 (because it’s a positive and a negative aspect on the given date ) or would it be +1+1=2 ( because it’s 2 full aspects occurring on the same date) ? At any given point in time it is unlikely that any planetary aspect is exact. For example, it is rare for a perfect trine aspect of 120 degrees to take place for any one day. Instead, it is more likely the aspect is within an “orb of aspect” (e.g., an aspect of 119.78 degrees). Therefore, rather than it being a simple “1+1=2” situation, it is more likely that it is a “0.972 + 0.995” situation. The more exact the aspect, the closer the value is to 1.0. Alternatively, as the aspect strays further away from a perfect aspect, eventually the value for that aspect reaches zero. Toward the end of his book Stock Market Prediction, Donald Bradley included a table with logarithmic values to apply to aspects that are not exact. These values assign exponentially less weight to a planetary aspect as it moves away from being perfect (e.g., as it moves away from an exact trine aspect of 120 degrees). After taking into account the “exactness” of each aspect, all the planetary aspects for the Middle Terms are calculated. Each of these aspects individually is either “positive” or “negative” in value. The value used for the Middle Terms portion of the Bradley Siderograph is based on the net “positive” or “negative” value for all of the Middle Terms aspects in the aggregate. For example, if the total value of all the “negative” Middle Terms aspects for a certain day is -25.7 and the total value for all the “positive” Middle Terms aspects on the same day is 12.7, then the “raw” Middle Terms value for that day would be 13.0 (i.e., the combined total of -25.7 and 12.7). This “raw” value of 13 for the Middle Terms is then added to the “raw” values for the Long Terms and Declinations to arrive at the “raw” value for the Bradley Siderograph itself. Thanks very much for explaining this. This has made it much clearer. Has there been and studies using the gross value of negative + positives? It’s seems like it could be an interesting as in the hypothetical situation of say 4 exact-ive aspects and 4 +ive aspects the net would be 0 but I’m fact there are a huge amount do planetary activity. Hi , given that 2008 was such a major year for the market , it doesn’t seem like there were that many major turn dates signalled by the siderograph. Why do you think this was? There are a variety of factors that combine to influence security prices, and it is rare (if not impossible) for any one indicator to capture all of the significant changes in security prices. 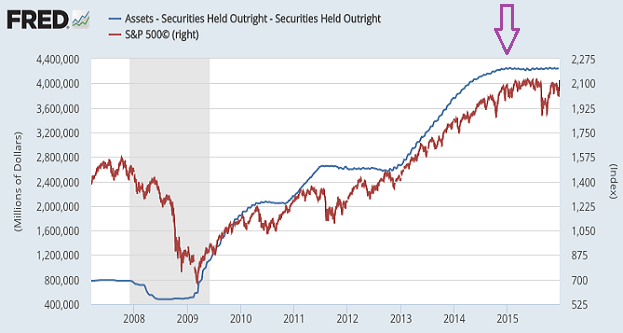 For example, the S&P 500 appears to have had a high correlation with the size of the Fed’s balance sheet (see the links below for details). Clearly the Fed’s purchase of securities can have an influence on security prices. Similarly, the housing bubble bursting in the U.S. in 2008 also had a significant influence on the market. Therefore, it is not unexpected that material changes in security prices would not always be captured by any one indicator. I am new to this site so was wondering if someone can explain if the S+P is being projected to fall to 2230 by mid December of 2017 based on the posted chart? I am not really clear on how to comprehend the chart with green line going down to 2230 Dec 17 (I am assuming a projection is being made for the S+P to fall to this level). Thanks for your comment. For the Bradley Siderograph (i.e., the green line in the graph) the focus is typically on “turn dates” in the indicator (i.e., the dates when the indicator reaches a high or a low) rather than the absolute level of the indicator. Therefore, there is no projection about the future level of the S&P 500. Instead, the upcoming “turn dates” (e.g., December 3, 2017, January 17, 2018, etc.) represent dates to watch the market closely to see if it appears to be changing direction. You are correct that the S&P 500 has been trending in one direction for a long time (i.e., onward and upward with only minor pullbacks). However, as I mentioned in my comment below to Gary, eventually we’re going to see a pullback. I agree that a correction is overdue and could happen in the next month or so. That being said, between now and the end of the year I’m the most focused on the December 6, 2017 Long Terms turn date with a power of 100/100. Past performance is obviously no guarantee of future results, but over the last 15 years the Long Terms turn dates with a power of 100/100 have performed relatively well. Matt, just looked again at the charts and astro charts indicating top here and dwn for a while, is that correct, i cant see where the August bottom and then high into Sept. Have we seen the top or near there. Im still confused are u saying the bottom was MID AUGUST low and from here we see further highs. Charts are indicating we go down from here till Dec, is that not correct. The Bradley Siderograph Turn Date on August 19 with a power of 17/100 happened to be a low. However, as noted in the “Nature of Turn Dates” page, a Turn date can take place at both highs and lows in a security’s price. You are correct that the Bradley Siderograph declines after the Turn Date on September 7, 2017. However, the Bradley Siderograph is typically leveraged for its Turn Dates (i.e., when the Siderograph changes direction from up to down or vice versa) rather than the focus being on whether or not the Bradley Siderograph itself is increasing or decreasing. The “Nature of Turn Dates” page will probably be the most helpful in explaining this further. See below for a link to a graph illustrating how the S&P 500 experienced a temporary low on August 19, 2017 as well as a link to the “Nature of Turn Dates” page, which has additional details. Apologies – I should have read your website in detail first. I can now how your calculation method differs. Congratulations in that you appear to have nailed the August 19 low and the market also appears to be heading towards an early Sept rally high. Thanks for your interesting website. I’m confused. I have a copy of the original Bradley Siderograph book and none of the dates shown in your charts match the dates shown in the book. For instance the book shows a possible high Aug 26th then no other dates until lows on Sept 30th and October 8th. There isn’t a date shown for Sept 5th or 7th (which I accept based on your work could be a rally high). Is there a reason why some of the dates you use appear to be different from Bradley’s original book? Gary, I had bought ( shorts ) late last week and early this week. I have been selling them off from yesterday and today. One more batch to sell for Monday or Tuesday depending on Market action. I do not get to cute with my trading trying to pick the exact lows or days. Bulls and bears make money, pigs lose out. I will be going going back long for a few days early next week until the end of the week. All the best to you. I have been short going into Aug 21st give or take a day or two. I plan on going back into the shark infested waters approx. mid week of Aug 23rd. Good luck everyone. Sept.5 is 17/100 declination power and Sept.7 is 29/100 Bradley power.How significant are these powers and does it mean markets can top around that time and inversion ? Thanks for your help. Thanks for your comment. It’s possible a top or bottom could take place on these dates. However, given the relatively low “power” I would not personally place as much weight on these turn dates themselves. However, it’s interesting to note the significant decrease in (1) the Bradley Siderograph, (2) the declinations, and (3) the middle terms around these two dates in mid-September. I am having difficulty interpreting the Turn Date, Aug. 19. I was assuming the turn date meant a turn down but the chart show a definite turn up into Sept. In Sept. there look to be a significant TurnDown. Will someone please confirm or negate what I am seeing. I am new. Thanks for your comment. Turn Dates can have “inversions,” which is where a bottom in the siderograph corresponds to a top in the price of a security or vice versa. Therefore, the upcoming Turn Date on August 19 could correspond to a top in the S&P 500, which would be an inversion. I hope this helps, but please reach out if you have any additional follow up questions. The Advanced Astro Indicator for the S&P 500 tops a little later in the summer than the pure Bradley Siderograph itself. Right now the market has some bullish signals (e.g., new highs) as well as bearish signals (e.g., small cap stocks underperforming large caps). Therefore, regardless of what any one indicator might point to, I personally like to take into account a variety of factors when assessing the market. The Bradley Siderograph has matched the S&P 500 quite closely for the first half of this year. However, as you may have heard me say many times, past performance is no guarantee of future results. June 30 turndate and now July4th turn,so is July 4th a high anyone??? Hi Matt how should I manage all these turn dates coming up from tomorrow onwards till the 4th of July two of which are 100/100!! Is there possibility to have huge volatility in the spx? Hi Enrico, Jack, Gary, and others — thanks for your comments. I just released a new YouTube video that goes over the June 21, 2017 Bradley Turn Date with a Power of 100/100. One of the key highlights is that the Advanced Astro Indicator also appears to show a top for the S&P 500 in July (i.e., shortly after the top in the Bradley Siderograph for the year). Also, if you’re curious about how the “Power” for the Turn Dates is calculated, feel free to check out a comment I just left for Vikalp on the “Formula” page that provides an overview of what goes into the calculations. See below for the links. Thanks Gary, I was long going into March 20 and on the 17 I loaded up my long position. Thanks to Matt and Bradley. Any pull back on Bradley dates maybe chance to go long. Good luck, thanks Matt. Hi Matt, This may be off topic, but does your work show any correlation between the middle terms and gold stocks as measure by the GDX ? GDX made a significant low on Dec. 20, 2016, a significant high on Feb 8 and a possible major top four trading days ago on April 13. For the GDX, historically a Middle Terms Turn Date with a power of at least 59/100 resulted in a turn 76% of the time. Specifically, 76% of the time the GDX’s direction in the 17-18 days before the Turn Date was the opposite of the price direction in the 17-18 days after the Turn Date. However, please note that past performance is no guarantee of future results, and this comment (and the site more broadly) does not contain any financial, legal, or other advice. Click here for a screen shot of the results. Also, click here to see the specific Middle Terms Turn Dates I used for this analysis for the GDX. Given the relatively low Power of 19/100, I’m personally not too focused on the April 17 Bradley Siderograph Turn Date. The April 19th Middle Terms Turn Date with a Power of 59/100 could be similar to the previous two Middle Terms Turn Dates at the end of December 2016 and January 30, 2017. Hi, are the long term dates the most significant, or most powerful data points (100/100) for a major market change shown in your analysis? Please reach out if you have any follow up questions. Thanks for your reply and help.April 17 (19/100) turn:Do you see up turn or more down turn? Thanks for your comment. Given the relatively low Power of the April 17th Turn Date (i.e., 19/100), I’m not too focused on it leading to a Turn. However, I’m looking forward to the three 100/100 Power Turn Dates that are going to take place at the end of June and early July. Also, I’m interested to see if the the S&P 500 will be impacted by the upcoming solar eclipse that will cut across the entire continental United States on August 21st. The S&P 500 reached a plateau from the beginning of March until the March 20, 2017 Turn Date with a Power of 100/100. The day after this Turn Date (March 21) the S&P 500 dropped 1.24%, which was the largest one day drop since mid-October of last year. The S&P 500 then proceeded to decline further, and as of today (April 8th) the S&P 500 is still below where it stood at 2,373 on March 20. To summarize, the March 20th Turn Date was a relatively significant top in the S&P 500, and overall the S&P 500 has been declining since then. However, as we started to get closer to the April 3 Turn Date the market decline paused. After March 27 the S&P 500 began increasing until it reached a minor top around the April 3 Turn Date. The April 3 Turn Date appears to be a top similar to the one on March 20, but because of its lower power (i.e., 30/100 for April 3 vs. 100/100 for March 20), the top marked by the April 3 Turn Date is relatively small in comparison. Sorry for the delay in my response, but I hope that helped! ALL HAIL THE POWER OF BRADLEY !!!! Very well done and presented Matt! Although the signals were there, I was sceptic yesterday. Also, I wasn’t quite sure it will take place on the exact date. Thank you for putting this together and taking the time to present it to us! Thanks Jack — I appreciate your comments. Thanks Jim for your comment. I’m glad you liked it. Matt seems we were going from 3/2 to 3/14 than turn on 15th could this be the early 3/20 turn to the upside in to 4/17 turn? As you noted, after topping at the beginning of this month the S&P 500 has experienced some weakness over the last couple of weeks. If the March 20 Turn Date happened to be a “Middle Terms” Turn Date I would be more focused on short-term changes in trend. However, given that this is a “Long Terms” Turn Date, I would expect it to represent a change in the longer-term trend in the S&P 500. It very well could be that we could see some upside leading up to the 4/17 Bradley Siderograph Turn Date. However, based on the long run up in the S&P 500 since early November 2016, I’m personally looking for a topping pattern or some weakness in the S&P 500 around and after the March 20 Turn Date. Regarding the 100/100 turn long term turn date on 3/20/17. . . Novice to Bradley. At 10/100 and the market continuing up can I assume this is a pivotal move to the down side from here? Thanks for your comment. As you noted, the March 20, 2017 Turn Date for the Long Terms could coincide with a change in trend. Given that the S&P 500 has been in an uptrend, this change in trend could be a turn to the downside as you noted. I just completed an analysis of the extent to which the S&P 500 actually experienced a change in trend historically during previous 100/100 Long Terms Turn Dates. I’m going to record and send out a link to the video within the next day or two. If you haven’t done so already, I encourage you to sign up for free email updates so you can receive the results of this analysis when I send it out. Look for a box on the right-side of the main page (bradleysiderograph.com) where you can provide your email address to subscribe. Matt, which of the 3 terms middle, long ,declinations are considered to have the most energy ? Thanks for your comment. For longer-term changes in trend in the S&P 500 I personally prefer the Long Terms, which are based on the planetary aspects between the slower-moving further out planets (e.g., Jupiter, Saturn, etc.). 18 we turn up?Matt what do you think? Over the last couple of weeks the S&P 500 appears to have reached a temporary plateau in a trading range between 2269 and 2277. We reached this level after a 3 stage rally (i.e., a significant post-election upturn for most of the month of November, a smaller “Santa Claus” rally for the first coupe of weeks in December, and an even smaller rally for approximately the first week of this year). Overall the key takeaway from this is that the weakness in the S&P 500 over the last couple of days has been relatively small when compared with the significant upturn that led up to where we are right now. It is definitely possible that the S&P 500 could continue to rally, which would be supported by the strong uptrend since early November. As they say, “the trend is your friend,” and it’s usually a good idea to think twice before going against the overall direction of the market. That being said, from a Turn Date perspective, overall I see the S&P 500 as having increased significantly leading up to the January 18 Turn Date. Therefore, the relatively modest market weakness we’ve seen over the last couple of days could continue if this January 18 Middle Terms Turn Date signals a top. Thanks Jim — I appreciate your comment. I’m glad you like the new format. Thanks for your comment. On July 27, 2006 there was a high in the Bradley Siderograph with a Bradley Bars power of 100/100 that corresponded to a low in the S&P 500. Several months later on December 17, 2006 there was a low in the Bradley Siderograph with a Bradley Bars power of 100/100 that took place at approximately the same time the S&P 500 was making a high. Thank you Matt for the update. These charts looks great!! I like the new style very much! Thanks for your comments. I’m glad you like the new format. The response for the new format has been very positive, so I’m planning to roll this format out to the rest of the securities by the end of the year. Thanks a lot – you are doing a great job! On a quick view – for me the end of June 2017 looks most interesting – 3 x 100%!!! Have a good time and lucky trading! I completely agree — the Turn Dates taking place at the end of June and beginning of July appear to be the most interesting of the year. I look forward to seeing the market’s activity then!